Welcome to Week 8! Last week featured some huge games, with LSU taking down the #2 Georgia Bulldogs, to Oregon prevailing against Washington in overtime, to the karma of the 4th and five call living on and propelling Michigan State to beat Penn State (no, we will not stop, they deserve it after the call). This week features another great slate of games. The battle for Michigan adds another chapter, as Michigan State heads to the Big House in Ann Arbor in attempt to grab back to back quality wins. LSU faces Mississippi State in a Top 25 SEC tilt with potential playoff implications for the Tigers. Finally, a battle of undefeated teams takes place as the NC State Wolfpack (yes, they are undefeated. Bet you did not know that) travels to Clemson. Kick your shoes off and enjoy, because here we go! Preview: Arizona State is one of those classic teams that plays up or down to opponents. They played Michigan State in a tight slugfest that the Sun Devils ended up winning, then promptly went and lost to a solid San Diego State team. They played Washington and Colorado close. And if Stanford does not come to Tempe ready, they are going to get blitzed by a Sun Devil team coming off a bye week. Stanford, meanwhile, comes off of two straight losses, getting beaten by Notre Dame and then just out muscled by Utah. If Bryce Love can play he certainly changes the game, as he rumbled for 301 yards and 3 TDs against ASU last year, but this one is going to be close, especially with Stanford playing on a short week and ASU coming off the bye. Preview: Last week, we said this might be the best Michigan team in a long time, last week they proved us right. They put a beatdown on Big Ten foe Wisconsin, while Michigan State got their biggest win of the season after what has been considered a down year by many over Penn State. This could end up being just the momentum shifter the Spartans needed going into a hostile rivalry game on the road. They’ll need a huge day from Brian Lewerke and Felton Davis against this vaunted defense led by Chase Winovich who is climbing up draft boards. Preview: Um, don’t look now, but Iowa could easily finish the season with 10 wins. The only teams left on schedule with records above .500 are their next two opponents, Maryland and Penn State. It would be easy for Iowa to look ahead to its trip to Happy Valley, but the Hawkeyes must first survive a visit from a confusing Maryland team. The Terps have both beaten Texas and lost to Temple, which makes them quite the enigma, but we have an idea who Iowa is. The Hawkeyes’ offense is … not good, but their defense is stingy and strong, and if Iowa wins these next two games, they could very easily find themselves in a New Year’s Six bowl. They still have a chance at winning the Big Ten West too, if someone else hands Wisconsin a Big Ten loss. For a team without much preseason hype, the Hawkeyes could play a huge role in college football’s postseason. Preview: We are now in the post Mike Stoops era for the Oklahoma defense. This move was made not a moment too soon. The offense is high octane, championship quality. The defense has left something to desire. We shall see if an off week is enough time to turn it around. The Sooners face the Horned Frogs of TCU. If I were TCU, even if they have one of the best defenses in the Big 12 (which is not saying much), I would be very scared. Kyler Murray off a bye week? Oh boy. TCU was gashed last week by another mobile QB, Texas Tech’s Jett Duffey. Murray is like the legendary boss of mobile QBs. We could see a very large number next to the OU part of the scoreboard this weekend. Preview: This is an underrated matchup of the weekend. Virginia is coming off of a big win against Miami and Duke is having a really good season, coming fresh off of a 2 score win against Georgia Tech. Duke’s defense led by Joe Giles-Harris will have its hands full with the Hoos’ extremely athletic “thorterback” as Bronco Mendenhall like to call his starting QBs, Bryce Perkins. Duke’s offense has been clicking as well so Virginia will equally have its hands full. This game will come down to who can force turnovers and capitalize on those turnovers. Preview: This game could end up being one of if not the best game of the weekend by Saturday night. Clemson, fresh off of a BYE week will face off against a very hungry and emerging NC State team. 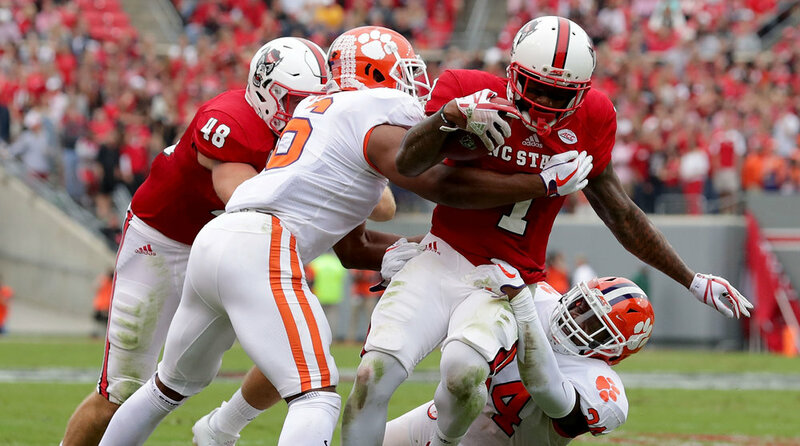 The Tigers are going to be healthy and bring that monstrous defensive line to get to Ryan Finley, meaning that they’re going to have to capitalize in the big moments. Lucky for NC State, they lead the nation in third down conversion percentage, this is where they will need to be on their A game. This game is always a tough one for Clemson, full of big plays, big emotion and this time there’s big implications as these are by far the best two teams in the ACC Atlantic. Preview: The Volunteers had a season changing victory over one team from Alabama last week. This week will be a much taller task as top-ranked Alabama comes to Neyland Stadium looking to secure a victory for the eleventh year in a row over their rival. Former Alabama defensive coordinator, Jeremy Pruitt knows how to prepare for this Alabama team but in order for them to have a chance they’ll need another huge game from Jarrett Guarantano against a defense that finally looked like itself again against Missouri last week. Preview: Colorado was sunk by one bad quarter against USC last week, as they gave up 21 points in the second to the Trojans. That quarter sunk the Buffalos chances at a 6-0 start, their first since 1994. Washington fell to Oregon last week, setting up a matchup between two teams looking to keep alive their conference title chances. USC was able to almost completely shut down Colorado’s offense, and Washington has a much better defense than USC. Unless the Buffalo can go off, I do not think they can win this game. Preview: LSU is riding high after knocking off then #2 Georgia last week. The Tigers dominated the game physically, rushing for 275 yards and holding Georgia, the top rushing offense in the SEC, to 113 yards in a dominating performance. Mississippi State also likes to run the ball, but in a slightly different way, as QB Nick Fitzgerald picked up 195 yards and 2 touchdowns on 28 carries in the Bulldogs victory over Auburn. Whichever team can establish their running game and stop the others will most likely come out on top. For LSU specifically, it is all about stopping the quarterback runs. Fitzgerald is completing just under 50% of his passes, so making him throw to win is the way to go. Preview:After losing its first three games of the season by a combined eight points, Purdue appears to have righted the ship. The Boilermakers’ turnaround will really be tested now though, because they play ranked opponents each of the next three weeks. For now, the Boilermakers can only focus on their next opponent, Ohio State. The Buckeyes are the current Big Ten favorites, led by Dwayne Haskins and his ungodly numbers in his first season as starting quarterback, but the defense has some question marks. The Buckeyes are susceptible to big plays, and they just found out that they will be without their best defensive player, Nick Bosa, for the rest of the season. Ohio State has had slow starts in several of its games this year, but the Buckeyes always seem to pull away when it matters most. Will Ohio State be able to continue surviving its lackluster first halves? Preview: The Pac-12 North may be the most compelling division race in the country, and these teams are right in the thick of it. Oregon should have beaten Stanford, and the Ducks looked like a potential playoff team against Washington this past weekend, but both of those games were played in Eugene. Can the Ducks translate their home success into a road win? Weird things happen under the lights in Pullman, and the Wazzou faithful will only be more excited by the Cougars’ first ever visit from the College Gameday. Can Mike Leach’s air raid offense solve Ducks’ defense to take control of the Pac-12 North? Preview: If the Pac-12 North is the most compelling divisional race in college football, the Pac-12 South might be the most confusing. USC’s win over Colorado put the Trojans in the driver’s seat, and the Trojans’ last four Pac-12 games are all very winnable. But first, the Trojans must survive their trip to Salt Lake City this week, where USC is a 6.5-point underdog. That is because Utah has scored at least 40 points each of the past two weeks, indicating that their once paltry offense is pulling itself together to support the Utes’ stout defense. USC may be in control of the Pac-12 South, but if Utah wins this weekend, the division race will once more descend into an unpredictable chaos.